I make cookies. Nice to meet you. Based in Fargo and ran by Emily Swedberg, Lucid Bakery aimed to show the land of "meat and potatoes" that plant-based eating (aka vegan) can be tasty, easy, and affordable. 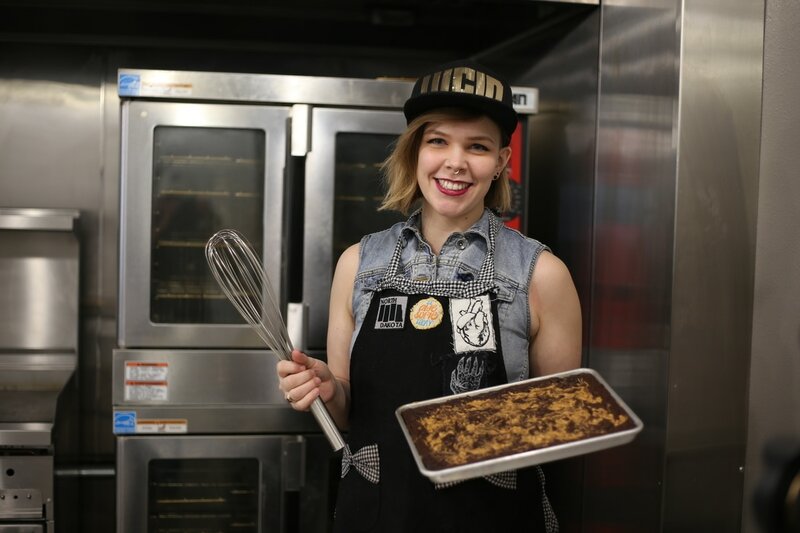 Lucid Bakery discontinued baking in 2018 so that Emily could focus on starting and running a music school in downtown Fargo, Amped School of Music. Becoming Lucid means to be aware of the choices you make, and what we eat is a choice we make 3+ times a day and can make a big difference on your body, on animals, and on the earth. ​• Young Blood Coffee Co.
Lucid Bakery was featured in the national magazine, Entrepreneur, in the August 2016 edition. Read the article here. "Lucid creates the tasty, nourishing, delicious treats -- and more. The most responsible bakery in the Red River Valley. Be warned: Once you're eating this stuff, everything else comes in a distant second." "Crafted fresh in Fargo, ND, Lucid Bakery provides a variety of textures and flavors that incite a riot of infatuation on the tongue before wooing the heart on their travels toward their tenured position in my tum." "I have to admit I was first skeptical about how vegan baked goods would taste. Now I know that the goods from Lucid Bakery taste wonderful." "...All were superb! Excellent quality and rich flavors. Too often baked goods elsewhere are overly sweet and lack complexity. This is not the case with Lucid. We purchased cookies to bring home but they never made it out of the building. Too delicious to wait!" "Emily is filling a void in the Fargo market for baked goods. Our community is continually becoming more conscientious about the foods we eat, and the impact those choices have on our health, the treatment of animals, and environment. It's great to have Lucid producing approachable, tasty products loved by those who are vegan as well as those practicing a traditional diet.